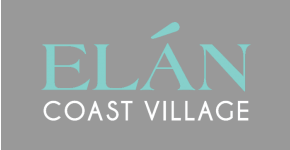 Elan Coast Village Apartment Homes for rent in Carlsbad, CA presents a compelling portrait of refined apartment living nestled in a central and well-kept location. Close to great schools, thriving businesses, and wonderful shopping destinations, ElÃ¡n Coast Village offers the best for all your needs. Our distinctive floor plans feature large private balconies and lofty 9ft ceilings throughout the spacious one and two bedroom floorplans. You'll love our great Coastal North County location, near Palomar Airport, La Costa Resort, Four Seasons Resort Aviara, Carlsbad State Beach and only minutes to Camp Pendleton, Del Mar, and Downtown San Diego! From beaches and theaters to fine dining and taco shops, Carlsbad Village is your North County destination of choice. This unique property features all the comforts of home and the conveniences of urban living. Enjoy life here at Elan Coast Village!